Atletico Echague Parana (La Liga Argentina) signed 30-year old American power forward Travele Jones (203-88, college: Texas Southern, agency: Promotex). 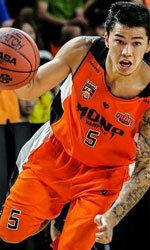 He played last summer at PEA in Thailand TBL league. In 6 games he had 10.2ppg, 8.8rpg, 1.0apg and 1.2spg. The last season Jones was tested by Saigon Heat in Vietnamese league where in three ASEAN League games he recorded very impressive stats: 19.0ppg, 9.3rpg, 2.3apg, 3.3spg and 1.0bpg. 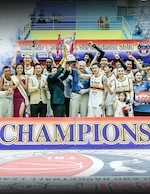 His team made it to the Thailand Basketball League Semifinals. The list of the past achievements is quite long as among others Jones was voted Asia-Basket.com All-Iraqi League Honorable Mention in 2017. He is quite experienced player. Jones has played in seven different countries on four different continents (Europe, Asia, Latin America and of course North America). He has played previously professionally in Belgium, Chile (Los Leones), Greece (Arkadikos), Japan (Sendai 89ers and Aomori Watts), Switzerland (Massagno), Uruguay (Atletico Welcome) and Iraq (Nift Al-Janoub). Jones attended Texas Southern University until 2011 and it will be his eighth season as a professional player. The eight-placed Mono Vampire Basketball Club completed the upset against the top-seeded Formosa Dreamers at home, 70-68, in Game 2 of the ASEAN Basketball League (ABL) quarterfinals. Romeo Travis (198-PF-84, college: Akron) made two winning plays in the clutch to allow last season's runners-up to advance to the semifinals after scoring the go-ahead basket, and forcing a jump ball that gave them the final possession with 2.8 seconds to go in the game. The Dreamers had the lead and the possession but 10 seconds to go, but turned the ball over after being called for a five-second inbound violation. Still leading 68-66 with seven seconds remaining, Formosa's Chen Shih Nien committed another fatal error by fouling Mike Singletary while the Mono Vampire import was attempting a three. Singletary made the first two free throws but missed the third, which was rebounded and tipped in by teammate Romeo Travis, giving them a two-point lead with less than three ticks remaining in the game. After missing Game 1 of the series, Mono Vampire center Malcolm White (205-C/F-88, college: LSU) and Dreamers forward Malcolm Miller (201-G-91, college: Southern) returned to the lineup for the rematch and quickly made their presence felt, each scoring the first basket for their squads in a fiery first quarter. The Dreamers threatened to pull away as they held almost double-digit leads on multiple occasions, but the resiliency of White and Singletary came through as they combined to score 29 first-half points, allowing the Thai squad to come back and enter the break with a slim 42-39 advantage. Both teams played evenly in the second half, and it came down to the wire for the second straight game. Mike Singletary led all scorers with 24 points to go with 10 rebounds, while Malcolm White added another double-double with 20 points and 11 boards. The hero of the ball game Romeo Travis only scored 10, but had 16 rebounds and seven assists in the win. The Dreamers' Tevin Glass (206-F-94, college: ETSU) finished with 23 points and 14 boards, but had little help as import teammates Malcolm Miller and Will Artino (211-C/F-92, college: Creighton) had a relatively slow night offensively as they combined for 27 markers but shot 10-27 from the field collectively. Kenny Chien added 12 points but also shot poorly against the pesky Thai defense. Both teams missed key guys with Formosa's primary playmaker Lee Hsueh Lin and Mono Vampire hotshot Tyler Lamb (196-G-91, college: LBSU) not suiting up due to injuries. Mono Vampire advances to the semifinals and are currently awaiting the winner between the Saigon Heat and CLS Knights Surabaya series.